It’s astronaut Archie’s first visit to Puzzle Planet. He and his robot Blip are going to have lots of adventures in this strange and exciting place, but Sydney the sneaky alien has other plans. 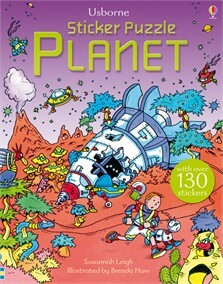 There are spaceship stickers to add, puzzles to solve, a canyon maze to navigate and friendly space creatures to rescue in this colourful book. Keep an eye out for giant space snails! With over 130 stickers, and answers at the back of the book.